The nightly noodle show at Mr. Chow Restaurant is just one of the many reasons to dine at the restaurant either in Beverly Hills or Malibu. At 8:15 p.m., the pasta chef enters the dining room, and the restaurant grows quiet. With a few claps, all eyes are fixed on the chef as with great fanfare, she whips, stretches, cuts, pulls, and spins a large ball of dough into long and thin noodles. It’s a show you will not want to miss. Mr. Chow is Michael Chow, the son of a Chinese Peking Opera Grand Master, Zhou Xinfang. Chow opened his first Mr. Chow in 1968 in London. With its success, he came to the United States and opened in Beverly Hills in 1974. New York foodies wanted him, so he opened a restaurant on 57th Street in 1978 and in Tribeca a few years later. Since then, he has expanded to Miami and Malibu. Chow designed the chic interior white tables with black lacquered chairs. Each table is lit underneath offering a dramatic effect. An elegant champagne cart was wheeled to our table offering five selections. The Perrier Jouet Brut from France was $22 a glass, while the 2003 Moet & Chandon, Dom Perignon, Brut from France was $60 a glass. The wine menu boasts a “Magnificent Seven” list including a 1982 Chateau Haut-Brion for $3,100 and a 1982 Chateau Petrus Pomerol for $9,300. The wine list offers many selections that are reasonably priced, like the Robert Mondavi Cabernet and Charles Krug Cabernet. For white wines, the Rodney Strong Chalk Hill Chardonnay was a good value. I selected the special Lychee champagne cocktail as a starter and we also ordered the rosé Laurent Perrier bubbly. The menu offers many authentic Beijing dishes and some of Mr. Chow’s signature dishes. The Maitre d’ Ricardo Amorim recommended we try the classic prix fixe two-course dinner for $58 per person. The dinners are a “balance of sky, land and sea,” he said. The Mr. Chow dinner includes fresh crab or fiery beef or steamed sea bass along with the two courses. For an additional fee one can add lobster, Mu Mignon or Brazino. A specialty at Mr. Chow is the Beijing duck, served whole. If you prefer a smaller portion of the crispy and tender duck, order the Gambler’s duck, served with rice pancakes, a delightfully sweet plum sauce, with strips of scallions and cucumbers. Another dish I would order again is the glazed shrimp with walnuts. The prawns are lightly battered and dipped in honey and pineapple juice. 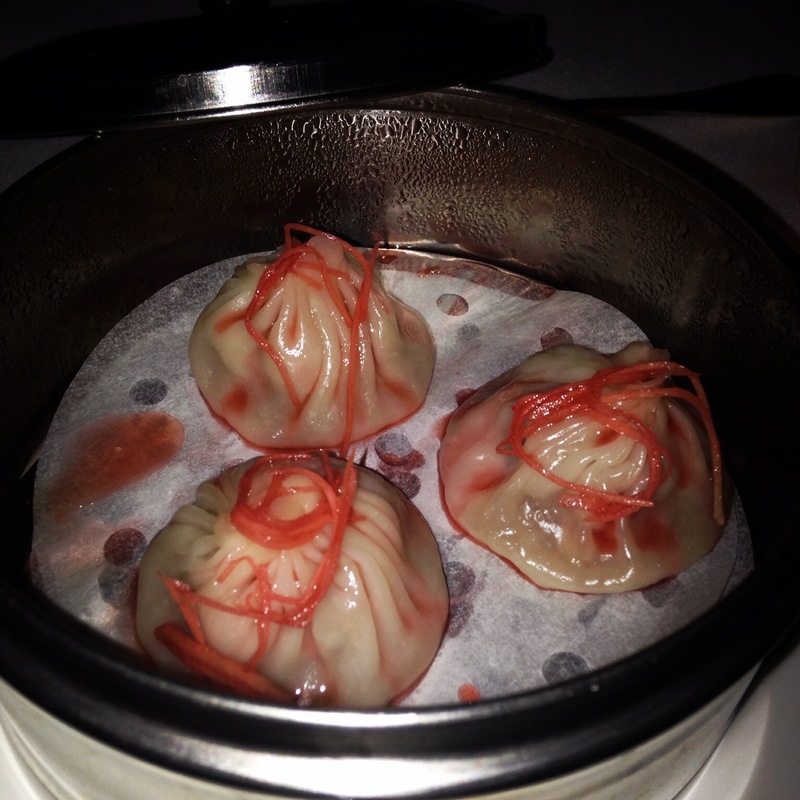 Dumplings at Mr. Chow – the Shanghai Little Dragons – are filled with pork and served with a bowl of red vinegar and ginger. There are a many Chinese restaurants in Los Angeles and beyond, however few provide the professional service, opulent atmosphere and entertainment as Mr. Chow. $$$ Open for dinner from 5:30 p.m. to 11 p.m. seven days a week. On Saturday and Sunday they are also open for lunch or brunch from 12:30 to 2:30 p.m.
3835 Cross Creek Rd., Malibu, (310)456-7600; or 344 N. Camden Dr., Beverly Hills, (310)278-9911. This article was featured in the May 15, 2014 Beverly Press and Park LaBrea Newspapers.